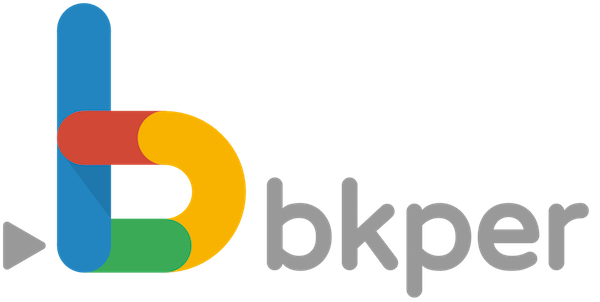 Bkper is a double entry bookkeeping system. This advanced article will guide you from the basics of double entry and how its interpreted by Bkper, to the details of choosing accounts, the account types and grouping accounts, so you can centralize the control of your business in one snapshot in the balance sidebar. This level of detail is not mandatory you can start off with just a few accounts. The colors in the image correspond to the account type colors in bkper. How does double entry bookkeeping work? Each time you make a transaction, like when you pay someone, you are going to make at least two entries in two different accounts as the resource goes from one account to another account. An account represents a T balance with a debit (left) and a credit (right) side. What else is there about double entry bookkeeping? A transaction always consist of a Debit and Credit entry in a book. Debit and Credit bookings are always in two different accounts. Debit and Credit are always in balance in a book. To start a book you make balance adjustments to your accounts. On Debit balances debit entries mean an increase on the account. On Debit balances credit entries mean a decrease on the account. On Credit balances debit entries mean a decrease off the account. On Credit balances credit entries mean an increase off the account. The payment by bank transfer of a bus ticket becomes a credit entry on your Bank account and a debit entry on your Expenses account. The bank account decreased and the expenses account increased. On a work trip some expenses are made and at the end of the month the company reimburses these expenses. The reimbursement of all expenses at the end of the month is done by bank transfer. 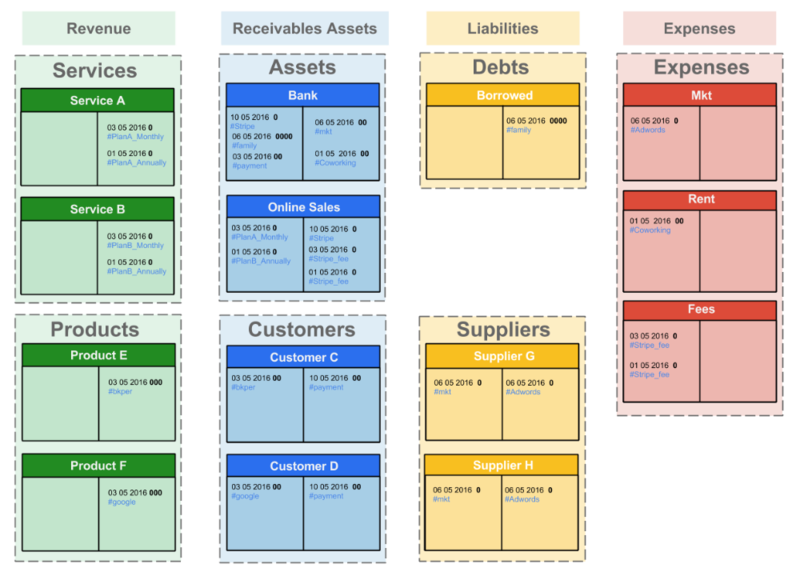 Bkper transactions are done according to the bookkeeping principles explained above, so when we take the combination of transactions described above and put the account balances together to draw the Bkper representation of these transactions on top of the balances you will see that they are exactly the same. And this is how these transactions actually are represented in bkper. With the previous in mind it is clear that transactions represent the exchange of resources between two accounts. If you are not familiar with bookkeeping or accounting concepts it is good practice to start Bkper with just a few accounts that represent all your activities. With a few accounts, transaction identification can be done with searchable #hashtags in the description. After a while with the need for more granularity grows naturally and that is where you can start adding granularity to your book. Add accounts that make sense to your business activities and that are important to your balance sheet or income statement. For example detail the online payment as receivable besides your bank account and you might find it important to detail expenses into separate accounts in order to track their balance values during a running period. Note: the size of the balances in the image above is just for visualization purposes and has no relevance for bookkeeping. 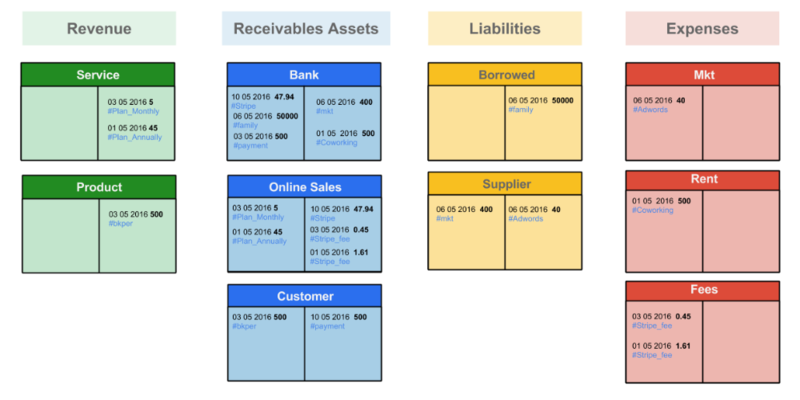 Account types determine if an account is shown on the balance sheet or if it is shown as part of the income statement on the balance sidebar. 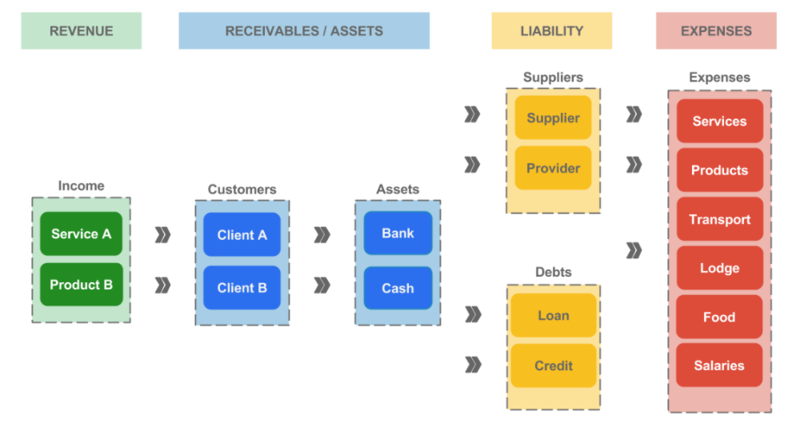 Asset (blue) and Liability (yellow) accounts are represented as permanent accounts on the upper part of the sidebar, together they represent your balance sheet. 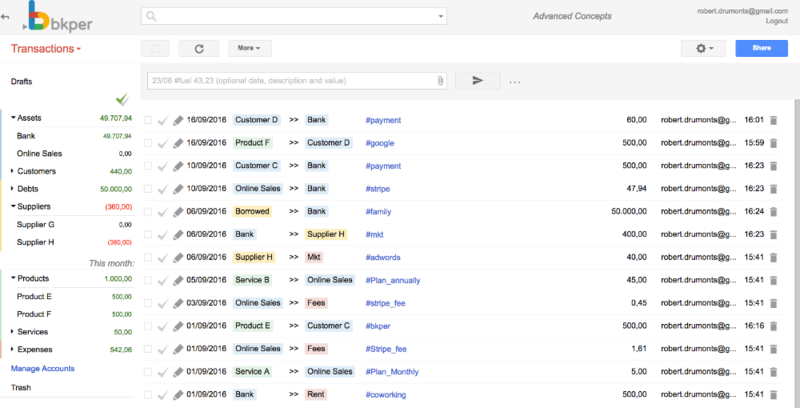 Income (green) and Outgoing (red) accounts are represented as non-permanent accounts on the lower part of the sidebar, together they represent your income statement for a given period. 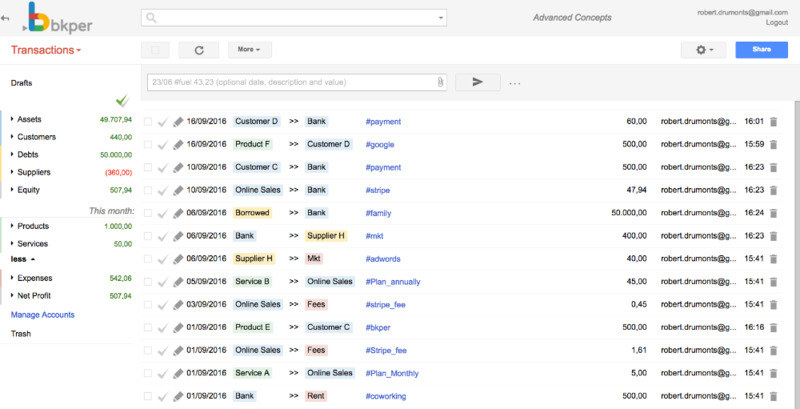 With accounts that represent financial movements, you can start to group accounts that hold the same entities and get their total balance value on the sidebar. 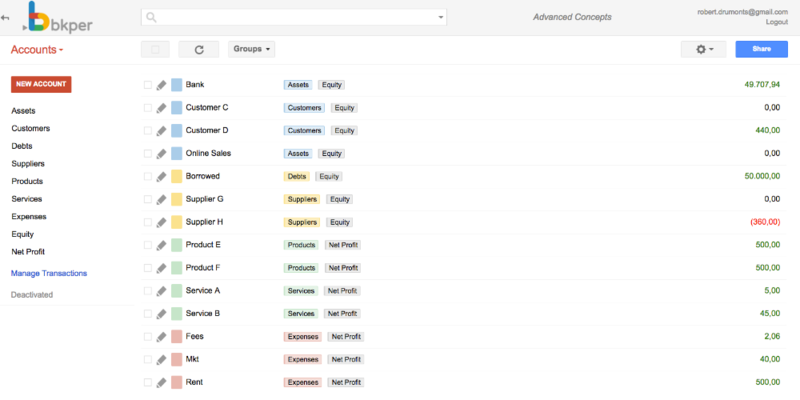 Group all customer accounts into one group to show the customer balance value on the sidebar. The same applies for other accounts within revenue, assets, liabilities or expenses. 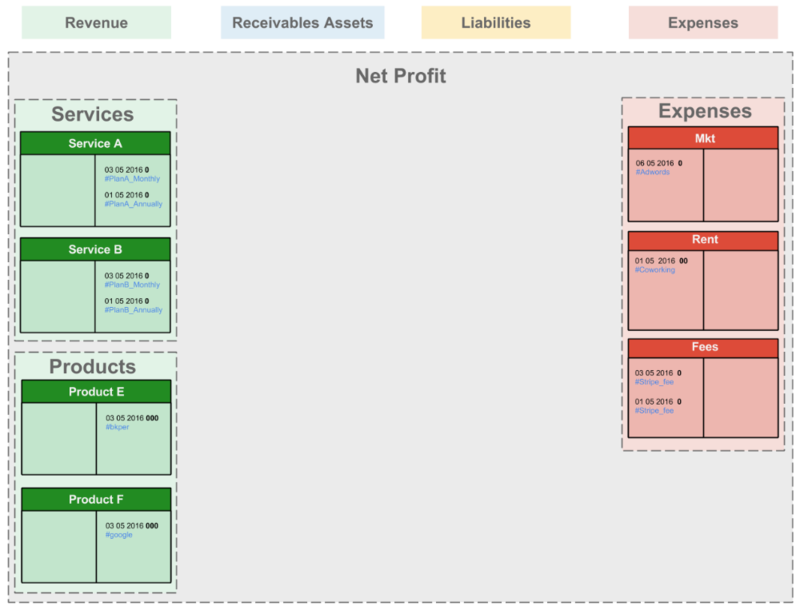 Bkper does not allow to group Permanent Accounts with non-permanent accounts but you can group Assets with Liabilities resulting in your Equity and grouping Revenue with Expenses gives your Net Profit for a given period. Note: The group totals on the balance sidebar, now it is possible to see the balance total of all your bank accounts together in one place. 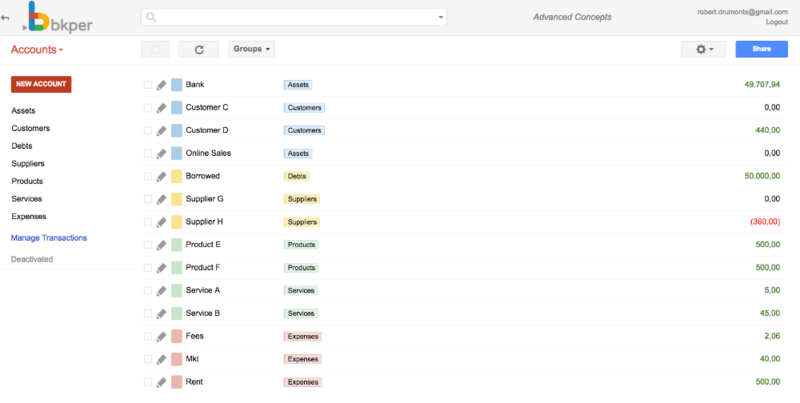 Grouping permanent accounts will show the result of your balance sheet on the balance sidebar. Grouping non-permanent accounts will show the result (net profit) of the selected running period on the bkper balance sidebar. 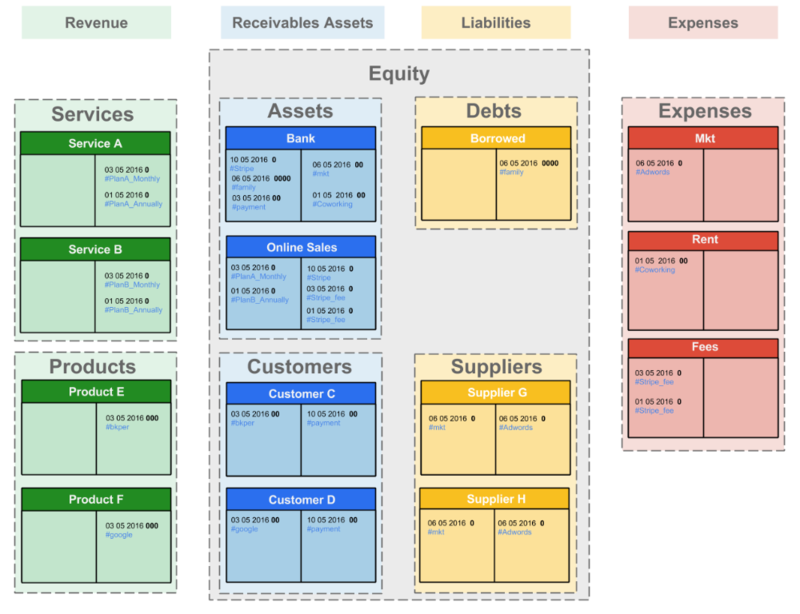 The asset and liability accounts have only been left out of the image above for visualization purposes. Groups that hold accounts from two different types are colored gray on bkper. The Equity and Net Profit Balance Totals on the balance sidebar. Permanent accounts are organized on top of the balance sidebar and non permanent accounts are shown for the period of the current month bellow. Permanent account groups and None Permanent account groups are colored gray.